Justin Atkins of Florence, Ala., won the 2018 Bass Pro Shops Bassmaster Central Open No. 4 held on Logan Martin Lake, with a three-day total of 38 pounds, 3 ounces. 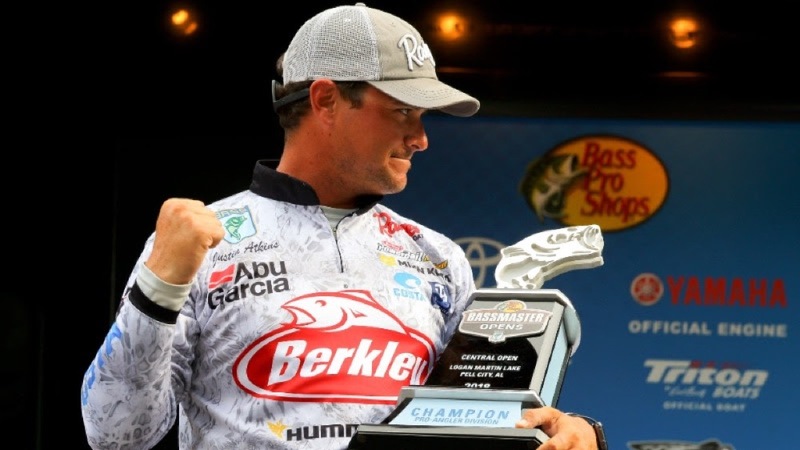 PELL CITY, Ala. — Justin Atkins has never been happier to admit he was wrong than he was on the final day of the Bass Pro Shops Bassmaster Central Open at Pell City Lakeside Park. The bass fishing pro from Florence, Ala., caught heavier bass than he thought he could and surged from eighth place to win the event with a three-day total of 38 pounds, 3 ounces. Atkins started the final round 2 pounds, 14 ounces off the lead. The lingering woes of a frustrating practice had him less than confident in pulling off the win. Nevertheless, weighing 13-11 — the day’s heaviest catch — sealed the victory. Atkins worked the same pattern he fished the latter half of Day 1 and all of Day 2. He started the first day by targeting big fish in shallow water around the Interstate 20 bridge crossing the lake and caught a key 3-pounder that anchored his 11-11 bag. After checking several of the offshore schools he had located, Atkins realized he wasn’t upgrading his weight, so he ran upriver to an area within about 12 miles of the Neely Henry Dam and spotted a row of rocks with fish set up perfectly for the current situation. A furious rally completed his limit and prompted Atkins to spend that evening studying his Lakemaster mapping chip to identify similar areas. He ended up locating several between 8 and 15 miles from the dam, in depths of 10 to 15 feet. “I noticed how much rock was out in the river, so the second day, once the water came on, I went up there and started idling,” he said. “I wouldn’t even fish until I saw them. I found a spot that ended up being really key. I caught all of my fish there today and most of them yesterday. Atkins caught his morning fish on a 1/4-ounce shaky head with a green pumpkin Berkley Bottom Hopper worm. On the river rocks, he used the shaky head in slower current and then switched to a Berkley PowerBait Rib Shad on a 1/2-ounce swimbait head in swifter water. Mark Rose, of Wynne, Ark., finished second with 37-5. After posting weights of 13-10 and 13-12, Rose entered the final round in first place, but slipped one spot after adding 9-15. Rose caught his Day 3 bass by dragging a Strike King football jig with a Strike King Rage Tail Menace trailer and a flipping a Texas-rigged Strike King Rage Bug into grass. Joshua Stracner, of Vandiver, Ala., took third with 37-2. After placing 35th on day one with 10-5, he improved to second on Day 2 after catching 14-14 — the second day’s heaviest bag and the second heaviest of the tournament. He caught 11-15 in the final round. In the co-angler division, William Mcnutt II of Bossier City, La., relied solely on a shaky head to win with a three-day total of 19-3. He used a green pumpkin Zoom Finesse Worm the first two days, but when he faced dirtier water on Day 3, Mcnutt switched to a junebug Zoom Trick Worm. The Phoenix Boats Big Bass of the tournament was awarded to Joshua Stracner of Vandiver, Ala., for a 5-12 largemouth on the pro side worth $750. In the co-angler division, John Roberson of Shreveport, La., won the Phoenix Boats Big Bass worth $250 with a 4-8 largemouth. Mark Rose of Wynne, Ark., won the Power-Pole Captain’s Cash Award of $500 for being the highest-placing angler who is registered and eligible and uses a client-approved product on his boat. Logan Martin Lake, Pell City AL.